Our Little Miracle was born on May 5, 2005 weighing in at a healthy 8lbs 4oz's, 20" long. He was full term and there were no complications. Trenten was a very healthy and happy bouncing baby boy. Eating and sleeping like all healthy babies. When he was 5 weeks old we noticed his breathing was irregular while sleeping. He would fall into a deep sleep and then wake himself up. At first it was kind of cute and non-alarming. As a new parent it never occurred to me that something could be wrong. Within days these episodes became more frequent, more severe and it was now obvious that this was not normal behavior, by any stretch of the imagination. We took him in to see the pediatrician who thought that he may have acid reflux and told us to put the bassinet on an incline to assist him. That night there was no sleep for Trenten or us. He no sooner fell into a deep sleep; when he awoke himself up gasping for air. Within hours we were taking him to see a pediatric pulmonary specialist and he was admitted into the hospital. There he was diagnosed with Infant Sleep Apnea. Trenten was put on medication to stimulate the part of his brain that regulates breathing, an air machine and Apnea Monitor. Now that Trenten is off all electric monitors we rely on our trained yellow lab, which is by Trentens side everynight as he sleeps, she can alert us if there is ever an issue. Trenten is 2 1/2 now and is doing wonderfully. We are eternally grateful for the amazing lifesaving care he received. June 10th, 2005: Trenten was 5 weeks old: On that Sunday night that is when we noticed him twitching and he was actually having episodes and was pulling himself out of them or waking himself up. (We had seen him do his before for about a week or more before this) We thought he was dreaming and my brother (an RN) thought he was just in REM. Not so, I picked him up and tried to burp him, that is not what he needed. So I sat there on the side of the bed with my one arm / hand cradling him and my other hand was lying on his chest. I defiantly was not expecting what happened next. All of a sudden he stopped breathing, for what seemed like eternity, was maybe only 10 seconds. Of course there was no sleep all night. No he never turned Blue or anything, which was the weird thing. See the specialist told us that it would of at least given them a little something to go on or to look for. Monday June 11th, 2005: We called the doctor. We had to go to the one on call as our doctor was on vacation that week. So we called and they finally got us in at 1:30 in the afternoon. I never thought that 1:30 would get there fast enough. I even debated whether I should take him to the ER. I was not sure if I could wait any longer. In my heart I knew something was wrong. Finally we arrived at the doctor's office. Well the first thing the doctor asked us was how often was he having these episodes and how long did they last. Well it was hard to say. I knew that he was having them for as long as 13 second maybe even 15 second on some. She was not all that concerned at first. The doctor kept saying she didn't think it was apnea. Yet we had no idea what she was talking about. So my husband looked it up on the Internet when we got home. Anyways the first thing the doctor suspected was reflux in babies. As the formula they are drinking could cause that. So the doctor informed us to put the bassinet mattress on an incline and give him 2oz bottles every 2 hours. We were also to let her know the next day how he was doing. She was not really too concerned unless he was up to 15, 18 even 20 seconds consistently. ** Today our research begins on the subject of Infant Sleep Apnea, as we try to educated our self and find out what Sleep Apnea is in babies. Tuesday June 12, 2005: We have been up all night and it just got worse. I really thought I was going to lose him. We were now on 48 hours + with no sleep and I felt like I was helpless to a point. I knew that this little baby was counting on me to protect him. Now it is 10am and he has had spell after spell. My husband gets a clock with the minute hand. From 10:15 to 10:30 he had 6 to 8 episodes and they were as high as 20 seconds. Trenten could not even cry anymore, as he now had no voice from all the fussing he had been doing. I called the doctors office right away with the results of that 15 minutes. With in 10 minutes the doctor herself called me back. She could hear Trenten in the back ground as we spoke on the phone. She told me that se needed to get us to a specialist right away. So by 11am the doctor's office called me back and had told me they had everything arranged with Nemours Pediatric Pulmonary in Orlando. They also told me that the Pulmonologist Office would be calling me directly to arrange for us to come in and it was going to be either on Tuesday or Wednesday. I told the nurse at the doctors office who called that we could not wait another day; I was too afraid I would lose him, I needed to see the specialist today, another day could be to late. OK, so now it is 11:10am and the specialist office called us. We have a Pulmonologist coming in; can you be here by 1pm. Now mind you we live an hour outside of Orlando and that is where they are located. We said of course and got our things and away we went. Once we arrived at the Nemours Children Pediatric Pulmonologist office they did an X-Ray, to check to see if he had anything obstructive in the airways. The doctor called for a nurse and another person in to conduct another test, which they put two things up through his nose checking for blockage etc. By this time I am beside myself and can hardly watch what they are doing and feeling helpless. Thank god I had my husband to lean on. Tuesday June 12, 2005: The first night in the hospital he stopped breathing / had spells 300 times. Of those over 200 were 20 seconds or greater. Wednesday, June 13, 2005: He ordered a MRI and then put Trenten in ICU. How helpless you feel when you see your little baby just lying there and you just want to make it all better. Wednesday night he stopped breathing / had spells over 200 times. More than half were 20 seconds or greater. He even had 5 or more that were over 50 seconds. His nurse Mike told us he kept him hopping all night. It was just heart wrenching to see this little baby with all these IVs and cords attached to him. Thursday, June 14, 2005: His doctor ordered a CT-San, and a Spinal Tap. They then started him on pure caffeine. It was a compound formula that helps stimulate the respiratory system. They sent fluids to a lab in Boston to be tested, as this was the only lab that could run the test that he wanted. He was checking for meningitis, and a list of other things that it could have been. We finally get most of the results back, but the fluids that were sent to Boston will take 2 weeks to get results. So meanwhile we continue the caffeine and monitor the episodes. Once they had the episodes under control and the medicine in him then we would be able to go home, but first we had to do a few more things. We met with the monitoring company and they brought us an apnea monitor. Trenten's doctor had to find us an air machine, which would keep positive air flowing through a nose canter placed across his face. See there was no CPAP machine for infants. We just needed a machine that would blow air constantly up the nose so it would remind him to breathe. Once we were able to solve that then we could take him home. Sunday June 17, 2005: Father's Day. We get to bring Trenten home. Trenten had a breathing machine so when ever he went to sleep we needed to turn it on. We left his nose canter on him all the time. It was easier and we didn't want to hurt him by taking the tape off that was used to keep it on his face. He was on this for about 2 1/2 months. We gave him Pure Caffeine compound 2 or 3 times a day. He was on that for 4 to 5 months. He had the actual apnea monitor, which he was on till he was 9 months old. He could of came off a little earlier, but we were not ready to give up to security of the monitor. I also wanted to make sure he was clear for a few months also. He still had a few minor episodes, but nothing to be too concerned about. Trenten was 10 weeks old when they did a sleep study on him and the youngest they had ever done at that time for a sleep study. Wednesday June 20, 2005: We had an appointment with our regular pediatrician; he told us he was glad to see that we were in his office. As what we went through was a very close call and we are lucky to still have Trenten here with us still today as things could of turned out very different if my motherly instincts had not kicked in. **Night after night and time after time the apnea monitor goes off. This is just heart wrenching each time, as your heart starts to pound and you have to look and determine is he having an episode, has he had an episode, was there a problem with the connection with one of the Leeds or was there a problem between the wrap which was wrapped all the way around his chest and the Leeds connection. We are in the house everyday. I am running on very little sleep. Some days you wonder where you get the energy to go on. My husband and I just do what we have to do. It is like the days never end. He is still working every day, doing the grocery shopping and all other shopping. My mom comes over and tries to get me to just go to the store and get out of the house for just a half hour. I just can't. I cannot bring myself to leave the house, the "What Ifs" cross my mind and I felt it very hard to put Trenten down. I felt that I was blessed with this little child and he was a miracle to begin with, so I was not about to let him down, as I knew he was counting on me. See Trenten would not even take much in the way of naps. The only time I could get him to sleep was if I held him. When he did go to sleep during the day it wouldn't be for long. I think he was afraid to sleep at time, I believe he knew something was not quite right. On most days I try to sit Trenten in front of the TV with bright colors playing in hopes of helping to stimulate the brain. He is not crazy of the TV and wants to be doing something else. September 2005: The day has finally come and we are able to take Trenten off the air machine, which he had to be connected to each time he fell asleep. This machine was so noisy that I thought for sure once he came off of it we would be able to get some sleep, but not really. Who could sleep worrying every night? October 2005: Trenten is now 5 months old and he has out grown the bassinette, so we decide to move him into his own room into his crib. What a big step for us it was heard not just rolling over and looking into the bassinette and seeing him right next to me. We slept very little for the first few weeks. I would get up on average 3 to 4 times a night to check on him and that didn't included the times the alarm would sound. November 2005: After a visit to Dr. Geller, the Pulmonologist Specialist we are able to take him off his medication of pure caffeine. Things are really starting to look up, yet we are not out of the woods just yet. November 2005: It is the day after Thanksgiving and my husband and I have our first night and my mom comes over to take care of Trenten. I am having second thoughts of going out, but see I had been coordinating this class reunion from my elementary days at a private school and people were in town from all over. For me not to show would have been understood with the circumstances, but it was time for me to take a big step in this journey. You have to remember that everyone deals with things differently and I was not comfortable leaving Trenten for a moment. 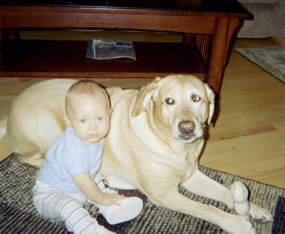 December 2005: Trenten is now just 7 months old. It is now the 2nd week of December and Trenten has gotten sick. We head to the pediatrician office and they tell me that he has bronchitis. He is put on medications and we are house bound. We continue with the medication and Trenten is not getting any better, it has now gone into pneumonia. We are taking each day at a time. If he doesn't start to get any better, they will have to admit him into the hospital. His pediatrician is the best, he is so old fashioned, and you don't find many like him any more. See if your child is sick he will call you at night to check on them and to see if you need anything. He is so sincere and caring for the children he takes care of. December 25, 2005: Christmas morning we are heading to my parents' for the big day. Trenten seems to be doing better, yet this will be the only place we go. After the day is over we head back home and stay in the house until the week after New Years. I would rather be over cautious and what is another week to me as long as I know that Trenten is completely better. February 2006: It is the weekend before our visit with Dr. Geller the Pulmonologist Specialist and Trenten is now 9 months old. On this Saturday night we are asleep and about 2 am the alarms sound. It is a race to the bedroom door between my husband and I, with thoughts running though our heads as to what is wrong, this alarm has not sounded off like this in months. As your heart is sinking and you are wondering what has happened, what seems like minutes is just seconds. Come to find out now that Trenten is 9 months old, he moves a lot more when he sleeps. So to our relief he had just moved and pulled all the cords and connections off. What a scare. See most babies are not on an apnea monitor that long, but Dr. Geller left him on it more for our peace of mind and I was not ready to give it up before this. The time has now come and we all agree it is time to take Trenten off the monitor, as he really was not having a lot of episodes according to the readings on the machine. The nights from here on out we will just take day by day. I am finding it very hard to let go and just sleep, so I am now a very light sleeper. The hours seem to just tick by and I see every hour on the clock. Between the two of us we must get up somewhere between 4 and 5 times a night just to check on Trenten. March 2006: Trenten is now pulling himself up and taking steps. He is on target, which is great. Soon he will be walking all over. May 5, 2006: Today is Trenten's 1st Birthday. What a day of celebration. Some of the hardest and scariest days are behind us. Throughout the year we will visit the Pulmonologist every few months for check-ups. We are now dealing with some other issues such as asthma and allergies. One of our biggest hurdles seems to be each time Trenten gets sick. See it is not like what would be normal for most children. When he gets sick it goes right to the chest and lungs, where he could be sick anywhere from 2 weeks to 4 weeks. It just seems to linger and as much as we try to get him to get it out, it is hard for a little one to do. May 5, 2007: It's Trenten's 2nd Birthday and things are just clicking along for us. Wow… You would never know by looking at Trenten that he had gone through all he did. He is truly a little miracle. The joy that comes from seeing him play and do new things daily is just a blessing. 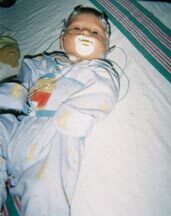 July 2007: Our research on Infant Sleep Apnea is still under way. We have discovered that most all the foundations and information out there on this subject caters mostly to adults. So we find ourselves wondering how many other parents have or is going through what we are. We decide that we need to gather as much information as possible and help to get the awareness out to other families. November 2007: We decide that we needed to do something to make a difference in the lives of children and this was obviously a sign from above. Thus came the Infant & Children Sleep Apnea Awareness Foundation. March 7, 2008: Today we open the doors to the foundation for the first time and go live with our website. This is also National Sleep Disorder Week. What a great day to celebrate! National Sleep Disorder week is the first week of March every year. May 2008: Well Trenten is now 3-years old and we just came back from the specialist. They did a 3-year old check up and did x-rays to see how the adenoids were. They looked OK, but he has been diagnosed with Asthma. We will just have to ride this out; it is something that we can live with and adjust too. October 4, 2008: Today we held our Inaugural Swing, Putt & Birdie Charity Golf Tournament in order to help raise awareness and funds for the foundation. All had a great time. December 2008: Dr. Geller does an allergies test on Trenten. We get the results back just before Christmas and find out that he has a slight allergy to EGGS. This is one of his favorite foods. So we are told no eggs till our next office visit. February 2009: We went for a visit to the specialist as usual. We have been recording his breathing so the doctor could hear how it is when he is sleeping. After listening to the last recording they decided to have Trenten run the hall at the office a few times so they could hear his breathing and listen for the wheezing which is caused by asthma. After he ran a few times he would stop and Dr. Geller would listen to him breathe. Dr. Geller says he is a very mysterious child with the breathing noise, so they decided to do a Bronchoscope. April 7, 2009: Today is the day for the exploratory and Bronco-scope. We are all hoping that this will answer some questions and shed some light on others that are still puzzling to doctors. Trenten was amazing through it all. The nurses and his dad told him they would be putting a space like mask on him to breathe in; he was so excited that he jumped right up in her arms and was ready to go. So off they went to the room where the doctors were waiting for him. The nurse told everyone that she never had a child so excited to go, yet Trenten loves to watch the real shuttle take off here at home so he was excited to be like the astronauts on a space mission. Everything went great during the procedure. As the exploratory unfolded they were still unable to determine part of the cause of the central sleep apnea which Trenten had as an infant, but we did find out that his adenoids are enlarged and are blocking approximately up to 75% of his breathing. So we will be looking to have them removed in the near future. This is just another one of the signs of Sleep Apnea which is OSA. We always thought that the adenoids would need to be removed as he still snores a lot when sleeping. Sleep apnea has the opposite effect in children than in adults. Children become very energized to say the least and reach the extreme of hyperactive in some cases. Adults become very tired and lethargic, they feel like they can't get enough sleep. To this day, we still check on Trenten several times a night. He still has the long periods when he gets sick. It all depends. So we are still working with those pulmonary issues. All in all he is great. Trenten also still has what they call long pauses. He takes a deep breath and will hold it for about 10 seconds or so, still to this day. His doctor said that Trenten just thought breathing was a hobby. We still visit the Pulmonologist for regular check-ups. Now you know a little of our journey and hopefully this will help you to understand why we have made this our endeavor. We feel that there are a lot of parents out there that are going through or have gone through what we went though. There is no real education or information on sleep apnea in infants or children nor Kids Sleep Disorders. We are working towards changing that. With our dedication and determination we know we can make a difference in the lives of babies and children.